It started when Johnny got to play with the favorite toy truck instead of you in daycare. And it continued throughout your life. Santa gave Sally the ultimate sought-after gift at Christmas and he didn’t give you one. Anna got junior high cheerleader and your cartwheel was much better than hers. Billy got a brand new truck for his 16th birthday and you got the privilege of sharing the family station wagon with your brother. Mary got the coveted college acceptance letter and you went to state school. Jeff was promoted. Julie got engaged. Pam had twins. Scott’s son was the football MVP. It’s just not fair. We have turned from a loving, trusting, “help your neighbor” community into a pick-up-your-sign-and-tell-the-world-it’s-not-fair society. And you are exactly right! It’s not fair! But what about this? I know a guy whose son was charged with some made-up crime, mocked, spit on, cursed at, beaten, ridiculed while walking to his sentencing and eventually beaten to a pulp and then hung…yes, hung on a cross with big, thick railroad spikes pounded into his hands and his feet WHILE HE WAS STILL ALIVE! Then a sharp, crown of thorns was shoved forcefully on his head until blood spewed down his face, squirting with every heartbeat in his chest. And they stood back and watched Him die!! Yea, life’s not fair. You betcha. Today we remember how unfair it was that Jesus was falsely accused, made fun of and tortured to death just so that we can get a free pass for all the not-fair stuff we get away with today. The difference? He came back to life! He is alive today. And He is waiting with open arms and a smile on His face to tell you He died and rose again to make sure we didn’t get what was fair. Accept this It’s-Just-Not-Fair gift from Jesus today and live in freedom as you exchange your life for the gift of His. 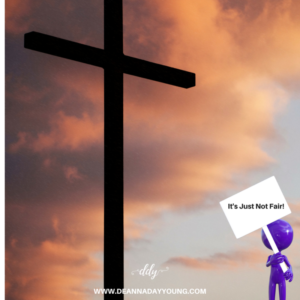 This entry was posted on March 30, 2018 with tags: #goodfriday by Deanna Young.